SIGN UP USING THE FORM BELOW OR CALL 314-291-7220. Although the holidays may be an exciting time of the year for you, your pets may find the festivities a little overwhelming. Even normally well-behaved pets can experience a little anxiety when their usual routines are disrupted. 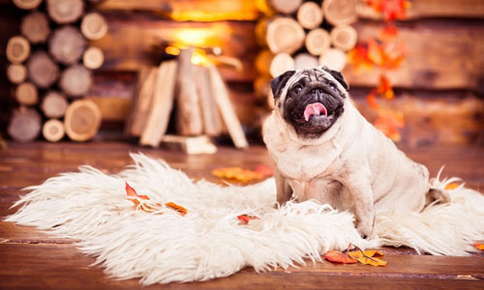 These tips will help you ensure that your furry friends truly enjoy the holiday season. The holidays are the perfect time to catch up with friends and family members you have not seen in a while. While you may welcome the visits, your pets may experience anxiety due to the steady stream of unfamiliar faces. Pets express anxiety in a variety of ways. Some become more aggressive, while others hide or shy away from strangers. Creating a guest-free haven in your home will give your pets the opportunity to escape stressful situations. Add a comfortable resting spot, food, water, and a few toys to a quiet room in your home when you are expecting guests. Place your pets in the room before guest arrive, but be sure to check on them periodically throughout the visit or party. If you have cats, add a litter box to the room. If guests are a regular occurrence in your home, it may make sense to help your pets adjust to the idea of strangers in their territory. Ask a friend your pet knows to visit you well before the holiday season begins. During the visit, ask him or her to pet your friend and offer a treat. Add several people that your pet knows to the next training session then add a friend your pet has never met to the mix. Every time an introduction is made, give your pet a treat so that they develop a positive association with meeting new people. If your pet doesn't warm up to the idea, take advantage of your pet-friendly haven during holiday events. The holidays are not the ideal time to make a furry addition to your family. During the chaotic holiday period, it's hard to give enough attention to your current pets, let alone help both new and old pets adjust to new circumstances. If you have been considering getting a new pet, postpone the new addition until after the holidays. Parties mean lots of noise, even if your pet spends the evening away from your guests. If you anticipate a noisy New Year's Eve to be a problem for your anxious pet, consider using an over-the-counter pet stress remedy or ask your veterinarian to prescribe a sedative. Does your pet hate fireworks and firecrackers? Gradually desensitize your furry friend to the noise by playing a recording of fireworks for a few seconds then offer a treat. Once your pet can successfully sit through a few seconds of the recording without fear or anxiety, gradually increase the length of time you play the recording. Some dogs feel calmer if they wear ThunderShirts during fireworks. The shirts apply gentle pressure and work the same way swaddling a baby does. Holidays are a particularly dangerous time for pets. Keep your pet safe during the holiday season by following these suggestions. Ribbon or string can wrap around your pet's intestines if swallowed and also pose a strangulation risk. Store wrapping supplies out of your pet's reach, and throw away discarded wrapping paper and ribbon immediately after opening gifts. Cats love to climb Christmas trees, but a quick scramble up the branches can knock the tree over. Prevent tree mishaps be securing it to the wall or ceiling. Surround your tree with a baby gate or pen to prevent your dog from knocking it over. Gnawing on an electrical cord can shock or even kill your pet. Place cords in PVC piping or special cord protectors. Keep lit candles out of the reach of pets or use battery-operated versions instead. Could you use a little assistance helping your pet handle holiday disruptions? Call us today to schedule a convenient appointment.